Black and White: Curious About My Art & Books? 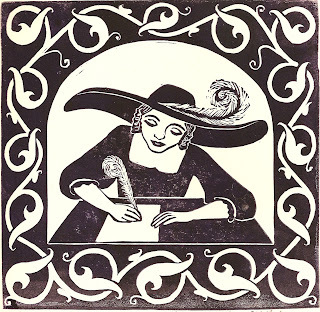 If you're curious to see more of my work, please visit these links to see my block prints, and to read more about my books. * My web site, nydamprints.com, for my art and writing. This has everything: all my currently available block prints, and information, blurbs, and previews for all my books. * NydamPrints, my shop on Etsy. * My "Author Page" on amazon.com, where you can read reviews of some of my books. (And to those who have read any of my books, I encourage you to add your reviews, too!) All of my books are now available on amazon except one. [Picture: Writing, rubber block print by AEGN, 2009.